As a current collegiate pitcher, the idea of head protection as a requirement for all pitchers, at any level, is less than desirable, and is impulsive based upon fear of rare, severe instances (from an on-the-field perspective). Over the course of my baseball career, I’ve had my fair share of “come-backers” and the experience can only be understood if you’ve gone through it multiple times yourself. It is scary. I’ve saved my teeth from being completely knocked out, as well as other essential body parts (you know what I’m talking about guys) by pure defensive human reaction, but, it is also part of the job, we as pitchers know that going into the game. Once you release the ball, you, the pitcher, becomes the 9th defender. Pitching coaches have strayed away from teaching the proper way to prepare to defend the position, and I say that having been coached by the average “daddy coach,” all the way up to nationally distinguished select travel ball and Division I, full-time paid coaches. “After-Release” defensive prep is simply not seen as important when compared to PFP’s and covering 1st base, communication, etc. Now, some will say PFP’s include “come-backer” practice, but how can you expect to defend a ball scorched back your direction at live speed after fielding, frankly, “softly” hit groundballs everyday at practice? 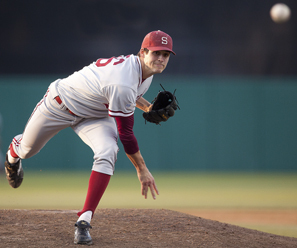 We are TRAINING pitchers to be “lax” because, mathematically, the chances of being hit by a line drive, while higher being essentially only 50ft away from the batter, are very, very slim. I want to be healthy and play the game I love as long as I can and I’m sure most players can relate to that. As a player, I think that before everyone hops on the “Helmets-for-Pitchers” bandwagon, the game’s teachers need to instead focus on, yes, the FUNDAMENTALS. I have my own ideas on efficient ways to prepare (pitching machine run at high-speeds aimed to the left or right of the pitcher and harder hit PFP grounders – Yes, I am suggesting the lessening of safety in a controlled practice setting in order to achieve higher safety during games…) but it isn’t my time yet to implement this since I am still a player and have little say on practice structures. Coaches need to find a way to do this, before conceding to the “headgear era.” Some may see this post and think I am young and feel invincible and therefore do not comprehend the aspects of safety involved and should’ve just kept my mouth shut; which is why I didn’t post my true name. But, hopefully, those of you that know and understand where I am coming from, will start discussions and consider fixing the root of the problem, like the BBCOR bats have done on the hitting side, in order to keep the game as safe as practically possible, while maintaining the beauty of the game in it’s entirety. Head protection for pitchers at all levels is long overdue. It’s time we start caring about our children and people in general. Protection is not only smart, it is the respnsible thing to do.